In front, from left are Madlokazi Clifford (Housing Committee in the community), Madlokazi Clifford, Mlahleni Siyabulela, Sibongile Koqo, Yandisa Malgas, Samson Boom and Yvonne Mnapu. Back: Zukile Majiza and Sipho Memanye. 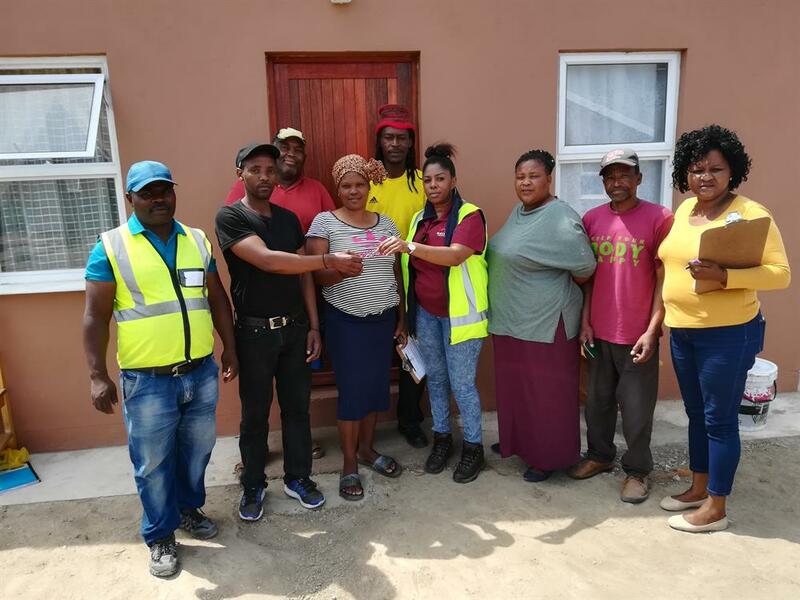 GEORGE PROPERTY NEWS - George Municipality has, with the aid of provincial funding, handed over 290 houses in the Thembalethu Upgrading of Informal Settlements Programme (UISP) to residents and 54 houses in developments in Extensions 42 and 58 in Thembalethu. Charles Lubbe, director of Human Settlements, said that the municipality has had the approval to construct 700 houses from 2016/17 as part of the UISP. The subsidy applications is an ongoing process and as beneficiaries get approved, the contractors get appointed to construct the houses in clusters. So far 290 houses have been handed over to beneficiaries. An additional 345 houses have been awarded to three contractors and some of the houses are already under construction. The remaining 65 houses will be awarded to qualifying contractors as soon as qualifying beneficiaries receive approval of their subsidy applications. The construction is dependent on approval by Western Cape Department of Human Settlements (WCDoHS). At Extensions 42 and 58, the contract was awarded to Moreki Distributors to construct 40 houses and has reached Works Completion in October, whilst the contract awarded to Makhare Holdings to construct 14 units has reached completion stage. The next phase is in its planning stage and the first engagement meetings have been held with the qualifying beneficiaries. The appointment of the contractors for these units will happen in the near future. 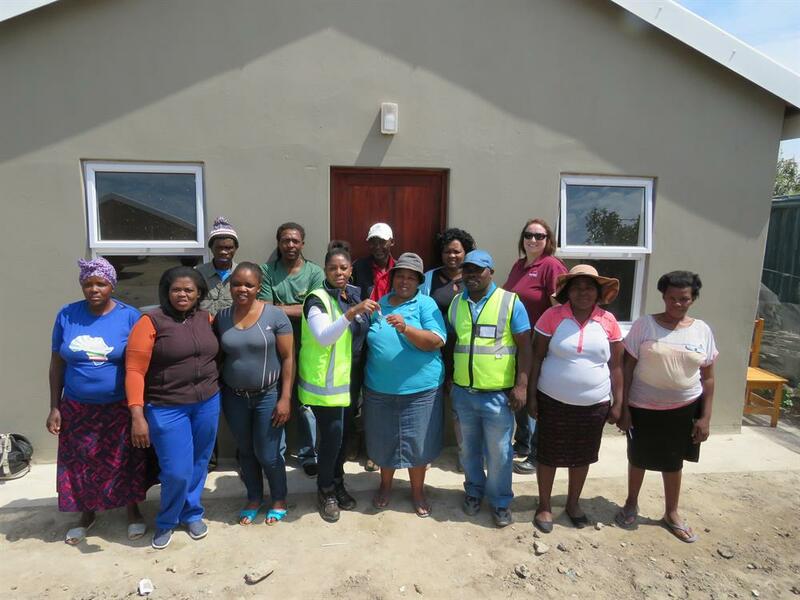 Housing beneficiaries of the Thembalethu Upgrading of Informal Settlements Programme (UISP). Front, from left: Moses Mentjies, Nosimphiwo Mayekiso, Nontsikelelo Zindlovu, Yandisa Malgas (Dept of Human Settlements), Fundiswa Klaas, Madlokazi Clifford (Housing Committee in the community), Nomsa Mhlophe and Victoria Puwe. Back: Xolani Mkhehle, Bathande Mqhondo, Mkhululi Mahlangabeza, Yvonne Mnapu and Dominique Otgaar (Dept of Human Settlements). The housing development in Blanco has been awarded to two contractors and they started with the building of top structures in October. Makhare Holdings has been awarded three houses and the aim is that these beneficiaries move into their homes by Christmas. PHP Supplies has been awarded the contract to build the remaining 105 houses. This project should be completed within a year.